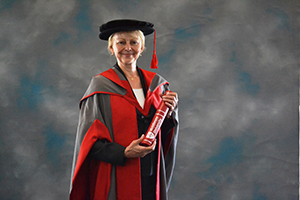 International research and policy expert Sandra Polaski has been recognised by Middlesex University, receiving an honorary degree for her contribution to social policy and labour standards. Sandra Polaski is Deputy Director-General for Policy at the International Labour Organization (ILO). Based in Geneva, this United Nations agency promotes workers' rights and encourages employment creation. Ms Polaski is responsible for the formulation of research and policy related to employment, social protection, conditions of work, social dialogue and international labour standards. Before joining the ILO, she worked to improve international labour and employment standards in a range of other high profile roles. These included positions at the United States Department of Labor - where she devised UK labour and employment policy - and at global think tank the Carnegie Endowment for International Peace. Sandra Polaski also served as the US Secretary of State's Special Representative for International Labor Affairs, under Secretaries Madeleine Albright and Colin Powell. Commenting on her honorary degree, Sandra Polaski said: "I'm really pleased to be recognised by Middlesex University in this way. "Graduates must recognise that they are going into a world of work that is changing rapidly. Globalisation and technological innovation are redistributing jobs around the world. "These changes are likely to accelerate, leaving much uncertainty about the employment prospects they will face throughout their careers. "However, I believe that there is enormous potential for smart and ambitious young people to shape this world, and to write the rules for a fair and rewarding global economy." "Sandra Polaski has been a driving force behind the improvement of standards for workers all over the world. "Her commitment to achieving fair social policies is absolutely inspirational, and we're delighted to be able to mark her achievements with this honorary degree."